To make the Angel Food Cake: Preheat oven to 350 degrees F.
Place sugar in a food processor and blend for two minutes, until it is superfine. In a medium size bowl, combine cake flour, salt and half of the fine sugar. Sift together and set aside. In a large bowl, whisk together egg whites, water, lemon extract and cream of tartar for two minutes. Switch to a hand mixer and gradually add remaining half of the sugar and beat this mixture until medium peaks are formed. Sprinkle some of the flour mixture over the top of the egg white mixture. Gently stir in and repeat until all of the flour has been stirred in evenly. Carefully spoon mixture into an ungreased tube pan. Bake at 350°F for 35 minutes until golden brown in color and cake is cooked through. Cool upside down on a cooling rack for an hour or until completely cooled. Once cooled, carefully remove cake from pan, scraping edges from side if needed. For the frosting: In a large bowl, beat the cream cheese and butter with a hand mixer on medium speed until creamy and light. Add lemon juice and beat just until blended. Gradually add the powdered sugar on low speed just until blended and then stir in the lemon zest. Set aside. To assemble the dessert: In a medium size bowl, combine the berries with 2 tablespoons sugar and mix thoroughly. Set aside. Spread butter on the outside of the cake slices. In a large skillet over medium heat, toast the slices on each side until cake is lightly browned, about 1 minute per side (watch it carefully so it doesn’t burn). Smiling Strawberries (these can be made ahead of time and refrigerated): To carve a strawberry smile (see diagram above): use a sharp paring knife (PLEASE be careful) and carve a curved smile underneath the eyeball area. To make the eyes: Place the 2 tablespoons powdered sugar in a small bowl. Take a tiny (smaller than pea size) amount of stiff frosting (use the powdered sugar on your hands if the frosting gets too sticky) and roll it between your fingers into a small ball, then place it on the strawberry. Make another one and stick it next to the first one. Take a black sugar pearl and stick it in the middle. When you are ready to serve, take a slice of angel food cake and put it on a plate. Spoon frosting on top and let it drip down. 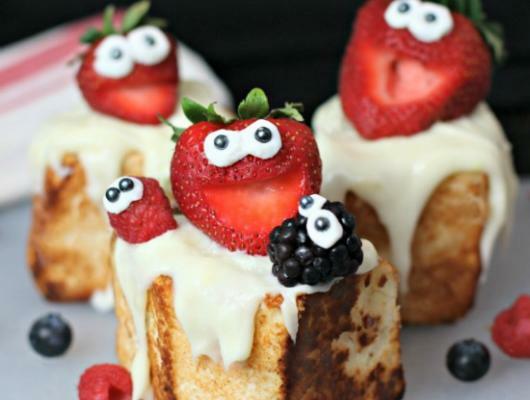 Spoon some of the sugared berries around the cake and place a Smiling Strawberry on top. Enjoy! 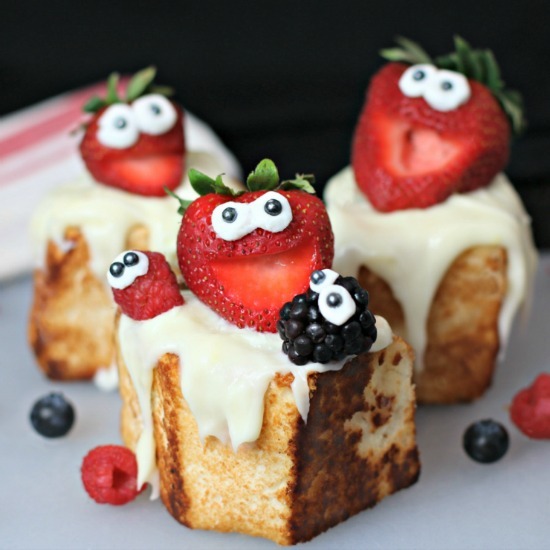 Toasted Angel Food Cake with Laughing Strawberries and Lemon Cream Cheese Frosting is light, fluffy, FUN and SO yummy!